2009: the only year they ever plowed the road. From Heller Camp to river mile 121 the river is mellow, class II swiftwater, and the canyon is fairly wide open with brushy banks. Just after mile 121 the river makes a left turn and the canyon bottom opens up and flattens a bit. Here there is a huge log jam (Jam Dam) that impounds the entire river. You can see it from the road around Needle Peak with binoculars. The dam diverts much of the flow through brush and trees into several different channels on river right. We portaged Jam Dam on river left, avoiding the mess on the right. At moderate flows there is plenty of time to eddy before the dam, but you would not want to be asleep at the wheel. About 1/8 mile below Jam Dam, all the water eventually finds its way back into the main channel and there is another river wide log jam. We were able to sneak this jam on river right. However, be extremely careful in this entire section as there is lots of dangerous wood that could easily shift around. From here down to Aqua Creek the river slowly builds gradient and constricts to about half the width of the top section; however, it is mostly just swiftwater. Approximately a mile below Aqua Creek is the first major rapid, Ledges (near Benchmark 4582T on the USGS topo map). It is a long series of river wide ledge holes (maybe 4 ledges all together). There is a huge eddy on the river right above the rapid and the horizon line is fairly obvious. Scout river left or portage river right, where the main trail is just up the bank. At moderate flows (2.5 to 3 feet) this rapid is Class III+ / IV-, but at higher flows the ledge holes could become considerably more stout. From Ledges down to Bean Creek the river drops around 50 to 70 feet per mile and is quite constricted with Brushy banks and a few swift, but indistinct class II/III sections. From Bean Creek to Broken Leg Creek is the steepest and deepest section of the canyon, and contains the standout rapids on the run. The first rapid, Corkscrew (class III+), is a fun twisting s-turn where the canyon pinches down through exposed bedrock. There are a few more class III ledge type rapids from here to the last rapid, Broken Leg Ledge (Class III), located just above Broken Leg Creek. We were able to scout most of the rapids in this section by eddy hopping. Note that on some maps, the St. Joe lodge is shown at Broken Leg Creek. This is a mistake. Its actual location is well downstream about 5 miles above the Spruce Tree. Below Broken Leg the river flattens out and the canyon opens up. We encountered one additional river wide log jam in this section that we portaged on river left. At Ruby Creek the river makes a sharp turn North around Elbow Ridge and the canyon continues to open up all the way to Spruce Tree. There are essnentially no rapids between Broken Leg Creek and Spruce Tree. We stopped and visited with the crew at St. Joe Lodge (a horse outfitter's camp), who also verified that its location is shown incorrectly at Broken Leg Creek on certain maps. At a flow of around 2.8 feet, we completed the run from top to bottom in 5 hours and 40 minutes, taking our time and stopping for lunch. The flat sections still maintain fast current so it is possible to cover them without too much effort and still make good time. However, at lower flows the run might become slow and scrapy. Length of the run is listed as 20 miles on the Forest Service trailhead sign, and 16 miles by other sources. Gradient figures from various sources are also highly inconsistent. By eyeball, I estimate the steepest sections at around 70 feet per mile. While there is not any particularly difficult section on this run, it is recommended for class IV paddlers as the consequences of a mishap could be significant, given the distance of the run and its remote, roadless setting. There is a good trail following the river all the way from Heller Creek to Spruce Tree, but it climbs up the canyon side in many cases and is not always easily accessible from the river. Moreover, in the lower section below Ruby Creek, the trail appears to cross the river multiple times. Bring basic survival gear just in case. The run is not recommended for rafts or catarafts due to the nature of the portages, and the narrow streambed. Best access to this run is from Gold Creek Pass in St. Regis, Montana. Exit Interstate 90 at St. Regis and head West through town, continuing past town on the frontage road till it splits. Turn left at the split, cross over the freeway and continue up Little Joe Creek. It is approximately 30 miles to the St. Joe River. When you reach the St. Joe, take a left and head upriver 10 miles to Red Ives Rangers Station. There is a visitor’s center at Red Ives manned by volunteers. Stop in and say hello and let them know you are in the area. Continue 2 miles upriver from Red Ives to the take out at Spruce Tree Campground. To get to the Put in, return to Red Ives and head up Red Ives Creek, located in the draw just behind the visitors center. Continue 11 miles to Heller Camp. Unfortunately, the road to Heller is usually snowed in till late June when flows are beginning to drop below runnable levels. Getting good beta on road conditions can be difficult as it is not frequently travelled until later in the seaon. 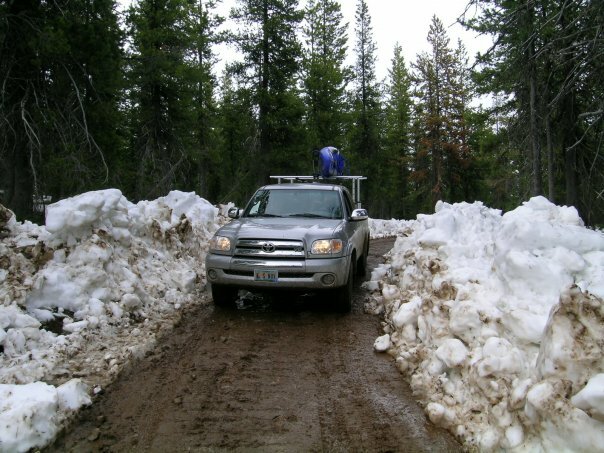 In the past I have been told by the Forest Service and others that the road was not yet open, only to find that it was indeed passable when I checked it myself. Don’t assume that the info you get second or third hand is accurate. Its best to make a scouting trip before making any firm plans. Four wheel drive is recommended although not mandatory. Given the length on the run and shuttle, it’s not a bad idea to set your shuttle the night before and stay at Heller Camp. Alternatively, you might camp at Spruce Tree and run shuttle early in the next morning. Both are excellent semi-developed campgrounds. Otherwise, plan on getting a very early start. Some have done this trip as a self-support, overnighter. There is a nice camp on the river right bank just after Broken Leg Ledge, and several potential spots below Broken Leg. Practice good bear safety. As of 2009 online flows are available from the USGS gauge at Red Ives (2 miles below the take out). The gauge is located on the river left, downstream side of the bridge, in front of the Red Ives visitor’s center. Below 2.5 feet the flat water sections of the run (12 miles) could be too low and scrapy. Above 4 feet the river is out of its banks, into the brush, and eddies become scarce. Optimal flow is between 3 and 3.5 feet.